Elderberry Recipes can be a wonderful and healthy addition to many of your favorite recipes. 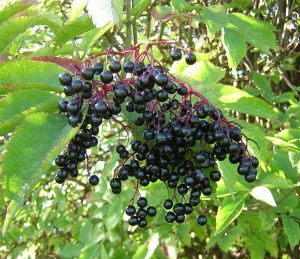 You will be surprised at how many great elderberry recipes are available. Work your way through them and you will not be surprised at how much you enjoy them. Take this recipe for elderberry jelly for example. Not only is it delicious but with the antioxidant properties you don’t have to feel guilty eating it. Add lemon juice and pour into kettle. Heat and bring to a boil, stirring constantly. Add pectin (some, like a crabapple jelly recipe does not require pectin but since elderberry is lower in pectin it will require the addition). Bring to a full boil and boil for 1 minute. Makes 3-4 half pints of elderberry jelly. Enjoy on top of a fresh, homemade slice of Elderberry bread. Place 2 cups of stemmed elderberries in an ovenproof dish and cover with vinegar. Cook at 300 F for 1 1/2 hours, or until the berries burst. Strain through a jelly bag or piece of cheese cloth. How about a recipe for elderry-rhubarb pie? Please? Helen, I wonder if you could just use this BlueBerry Rhubarb Pie Recipe and replace the Blueberries with Elderberries? Find the full recipe here:BlueBerry Rhubarb Pie Recipe Whatcha think? Let me know how it turns out!